Coming in 2015: Uber and Airbnb IPOs? Uber: The Alibaba of 2015? Alibaba was the cream of a bumper crop of initial public offerings in 2014. 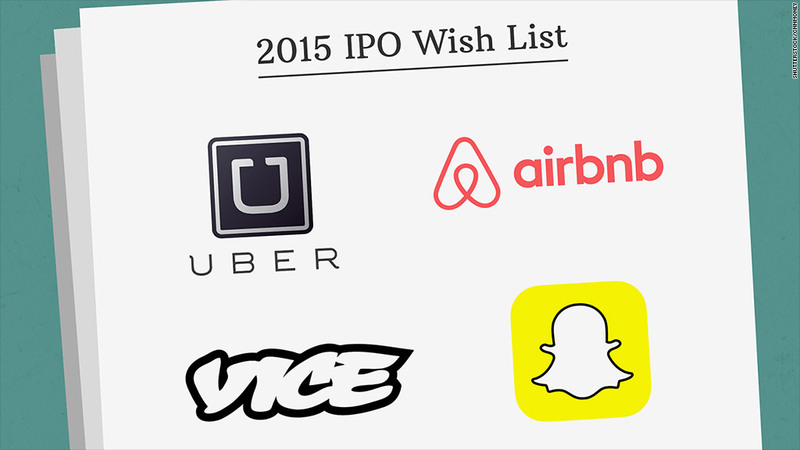 But 2015 may wind up being an even bigger year for high-profile IPOs. Controversial ride sharing app Uber could be a monstrous hit on Wall Street if the company decides to go public. Bad publicity about drivers, tone-deaf comments from executives and mounting legal woes have yet to make a dent in Uber. The company is already worth more than $40 billion based on its last round of financing. Chinese search engine Baidu (BIDU) recently invested in Uber. And Uber is already rumored to be generating about $2 billion in net revenue a year. Uber is just one of 42 private companies highlighted by venture capital database CB Insights as having likely valuations of at least $1 billion that could be considered IPO candidates for 2015. Real estate rental site Airbnb, whose rumored valuation of $13 billion makes it worth more than well-known hotel chains Wyndham (WYN), Holiday Inn owner InterContinental Hotels (IHG) and Hyatt (H), is another. So are cloud storage services Box (which has already filed for an IPO) and Dropbox, social media site Pinterest and payment services companies Square and Stripe. Snapchat, with a reported value of $10 billion is also being viewed as a hot IPO contender. It's ironic that the app known for disappearing images, videos and text messages may have to enter its finances in a public document that can never be erased. So did Vice Media, the edgy content creator that has the backing of Rupert Murdoch's Fox (FOXA) and A&E Networks. But it's worth noting that tech IPOs aren't the only ones that are likely to attract big interest. While Alibaba (BABA) and wearable camera company GoPro (GPRO) generated the most buzz among average investors, they were not the top IPOs of 2014. In fact, several small biotechs were the best IPO performers of 2014 according to Renaissance Capital, a firm that researches and invests in IPOs. There was strong demand for IPOs in many sectors. Renaissance said that 273 companies went public in 2014. That's the most since the 403 IPOs during 2000 -- the last days of the dot-com boom. Restaurant stocks also enjoyed a lot of success this year. Burger joint Habit (HABT), Mediterranean food chain Zoe's Kitchen (ZOES) and grilled chicken restaurant El Pollo Loco (LOCO) all soared in their market debuts. With that in mind, Renaissance predicts that Shake Shack, Smashburger and Brazilian steakhouse chain Fogo de Chão could all file for IPOs soon. It seems like investors are all hungry for the next big restaurant phenomenon like Chipotle (CMG). So don't be surprised if some of the hottest offerings of 2015 wind up coming fresh out of the oven ... and not Silicon Valley.